NBC Olympics: The network's coverage of the Sochi Games is reality TV masquerading as a sporting event. It’s reality TV masquerading as a sporting event. Bode Miller of the United States looks emotional after being interviewed by NBC’s Christin Cooper on Feb. 16 in Sochi, Russia. NBC’s Olympics coverage tries to be all things to all people. For serious sports fans, the Peacock shows every event from Sochi live, either online or on cable. If you miss (or don’t care to watch) that comprehensive coverage, NBC’s primetime and late-night shows highlight the best bits from virtually every winter sport, and feature production bells and whistles that show you why Ted Ligety’s skiing faster than everyone else. So, you can watch everything as it happens, and if that’s not good enough then you can catch it all later—you’d have to be a lout to complain about that set of options. I guess that makes us a country full of louts. Every two years, we spend the entire Olympics grousing that NBC doesn’t show what we want to watch when we want to watch it, that it ignores foreign competitors in favor of Americans, that there are too many commercials, and that the broadcasts are overtaken by contrived sob stories about some skier whose third cousin has leprosy. All of these things are true, and they’re all annoying, but it’s easy to understand NBC’s philosophy here. The network’s two top-rated shows last year were Sunday Night Football and the singing competition The Voice. Live sporting events—especially live NFL games—are gold for broadcasters, the rare bit of DVR-proof programming in this fast-forward-happy age. But the Olympics, from a broadcaster’s perspective, doesn’t bear much resemblance to the NFL. Rather, it’s The Voice, or American Idol, or The Bachelor, the kind of reality competition that introduces you to fresh young faces, fills you in on their hard-luck stories, and zooms in on their welling eyes as they succeed or fail. Why do we watch sports? Because we love the game, we care about one or both of the teams, we know the players, and we want to see who wins. Why do we watch NBC’s primetime coverage of the Winter Olympics? We don’t care that much about the sports (we’re not lining up to watch luge in odd-numbered years), we don’t know all that much about the athletes, and (if we care to look online) we already know who wins. What’s left is that it’s fun to root for whatever no-names wear the stars and stripes, and—whether the victors are Americans or otherwise—that it’s thrilling to watch any competition where the stakes are so high and the competitors care about the outcome so deeply. Given those parameters, you can understand why NBC’s primetime Olympics broadcast looks the way it does. The network’s getting-to-know-you, thank-you-mom Winter Games philosophy is also certainly shaped by the fact that the audience for the Olympics skews female. But the trouble with sports, whether they’re played on grass or ice, is that the storylines are slippery. Athletes get hurt and don’t make it to the starting gate. The favorites often lose. When you pay $775 million to broadcast a TV show, it’s got to be a pain when your biggest stars don’t show up. After all, it’s very difficult to introduce a whole new cast of characters in a single evening. But this is precisely where NBC runs into trouble. Every day during the Olympics, unscripted reality will necessarily intrude on the network’s pre-written narrative. When you press on with your storylines regardless, that’s a recipe for making viewers angry: The Olympics are a reality show where the stars get picked out before filming begins, and the cameraman doesn’t particularly care about following the winners. Last Thursday, NBC took this approach to its absurd conclusion, focusing much of its tape-delayed primetime telecast on Evgeny Plushenko, this despite the fact that the Russian skater had pulled out of the men’s singles competition earlier in the day. Rather than re-orient its coverage around people who would actually be skating, NBC showed a Plushenko feature while previewing his “upcoming performance,” then ran footage of the aquiline Russian warming up for his short program. You could tell this was more of a reality show than a sportscast because, after a commercial break, they showed the exact same Plushenko warm-up footage for a second time, in case you’d forgotten what it looked like in the span of four McDonald’s ads. Then came the not-so-shocking news that Plushenko wouldn’t be skating at all. This was “reality” masquerading as reality, a news event in the guise of a very special rose ceremony in which the Russian didn’t get a flower. 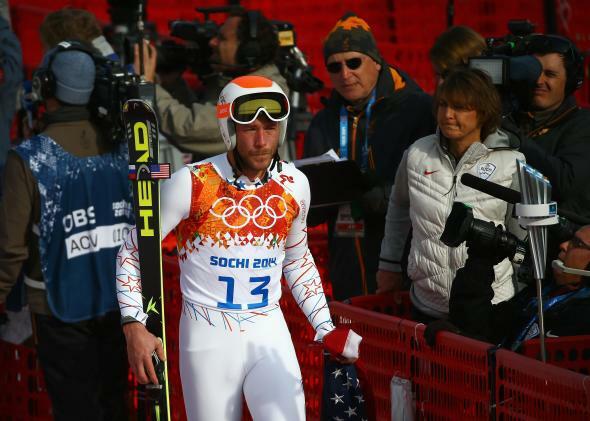 Then, on Sunday, NBC’s mountainside reporter Christin Cooper pressed Bode Miller about his dead brother until the super-G bronze medalist cried. It wasn’t all that notable that it got lachrymose on the slopes—this is what NBC does. What was remarkable about this couple of minutes of televised awkwardness was that it required the Peacock to willfully ignore an even better story. Standing next to Miller was Andrew Weibrecht, a newly minted silver medalist. With the benefit of tape delay, NBC had all day to work up a story about this other American, a fellow who’d overcome a huge number of injuries since earning a medal at the Vancouver Games. Instead, Weibrecht was asked to say a few words and then cropped out of the shot—it was time to focus on Miller, the man who Weibrecht had just outraced. The story of the evening, established in a pre-race feature, was that Miller had overcome the loss of his younger sibling to pick up his sixth Olympic medal, and that was the story we were going to be told. This is why we hate NBC’s Olympics coverage. When you bring the conventions of reality TV to sports broadcasting, you get an unholy idiot-box chimera, the type of broadcast that favors a dramatic backstory over drama on the slopes. We love watching sports because we want to see who wins, and how he made it to the finish line. Viewed through NBC’s lens, however, the Olympics are a series of athletic events unlike any other, the only sports in the entire world where the final score is less important than the pre-game chatter.